If there is a twentieth-century artist who truly needs no introduction, it is Picasso; if there is a twentieth-century artist about whom more books have been written than Picasso, we have no idea who it might be (though Matisse, Miró, and Chagall might come close). Picasso helped invent the artistic vocabulary of Cubism, Surrealism, and Post-Modernism. Along with a few other artistsMatisse, Kandinsky, Braque, Miró, Chagall, Léger, Giacometti, and Magritte spring quickly to mindhe invented modernity in art for the twentieth century. On this page and several linked pages, we present a sampling of the themes of our 2007-2008 Winter show: Masters of Modernity. Pablo Picasso (Spanish, 1881-1973), Le fils de l'artist / The artist's son. Color pochoir after a painting, 1930. 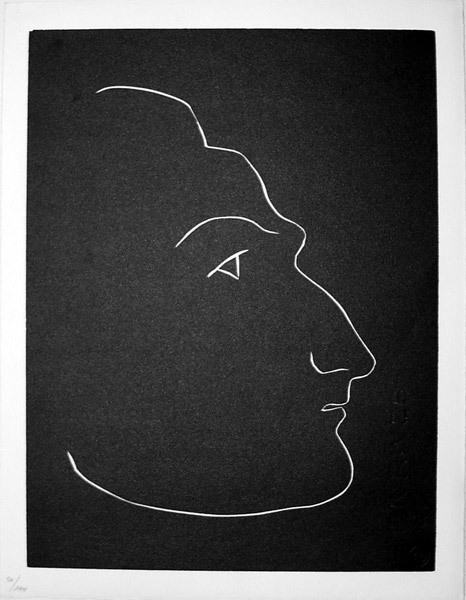 1250 unsigned impressions for Eugenio d'Ors's Picasso, published in Paris in 1930. Executed with Picasso's consent and under his supervision for this early study of Picasso. The first 50 copies contained an original signed and numbered Picasso lithograph executed for this book. Image size: 252x187mm. Price: $1,850. Pablo Picasso (Spanish, 1881-1973), Claude (M. 186, Gauss 531a, Cramer 60). Original lithograph, 1950. 2000 impressions for the front cover of Picasso Lithographe II published by Editions du Livre Andre Sauret (Monte Carlo, 1950). There were also five impressions combining the front and rear covers on Arches with wide margins. 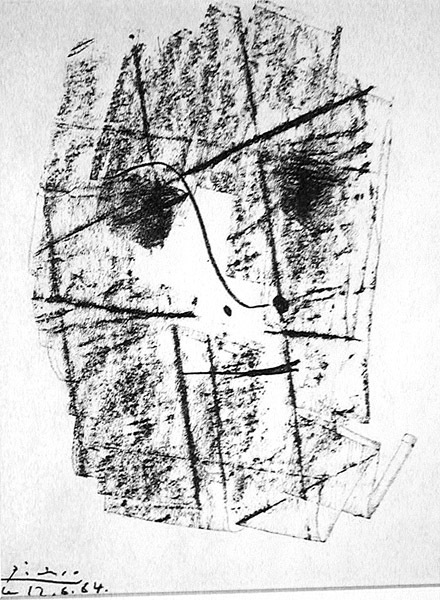 This portrait of Picasso's son Claude was made with fingerprints with ink on transfer paper transferred to stone. Image size: 313x228mm. Price: $2250. Pablo Picasso (Spanish, 1881-1973), Cubist Portrait of Kahnweiler (M. 403). Original lithograph, 1964. 900 impressions signed in the stone + 100 signed impressions published in Pour Kahnweiler. There were also 100 copies of Pour Kahnweiler reserved for contributors. Our impression is signed in the stone. Kahnweiler was Picasso's dealer for paintings from the teens until his death, and Picasso was quite loyal to him. This work was produced for a memorial volume. Image size: 300x220mm. Price: $1,600. 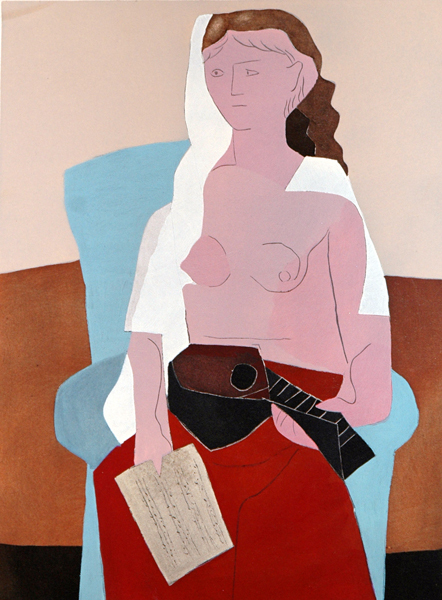 Pablo Picasso (Spanish, 1881-1973), Femme assise. Color pochoir after a painting, 1930. 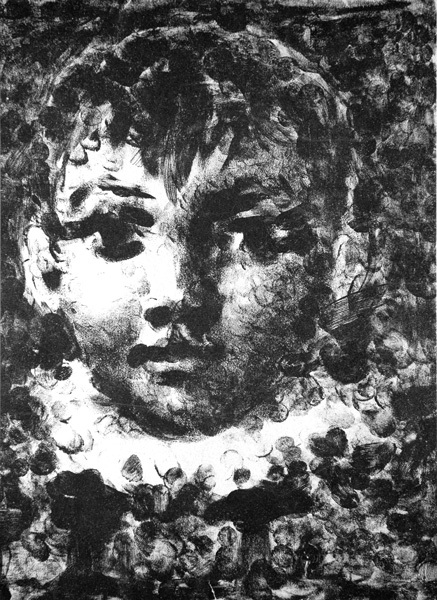 1250 unsigned impressions for Eugenio d'Ors's Picasso, published in Paris in 1930. Executed with Picasso's consent and under his supervision for this early study of Picasso. The first 50 copies contained an original signed and numbered Picasso lithograph executed for this book. Image size: 252x187mm. Price: $2,275. Pablo Picasso (Spanish, 1881-1973), Days of glory (B. 372). Original etching, 1945. 1000 unsigned impressions for Jours de Gloire, 1945, a work published for the benefit of the French Red Cross to aid released French war prisoners. A work of classic elegance. Image size: 190x136mm. Price: $1,600. Henri Matisse (French, 1869-1954), Harmonie jaune. Color pochoir (hand-colored stencil print) after a painting, 1929. 500 impressions for Florent Fels' Henri Matisse, published 1929 in Paris by XXe Siecle. 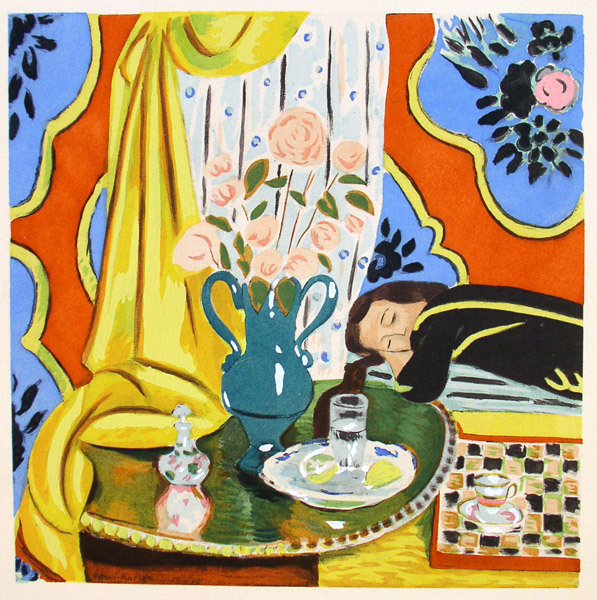 The pochoirs were executed under Matisse's supervision. This beautiful hand-colored piece is one of the few early color prints in Matisse's print oeuvre. Image size: 162x162mm. Price: $2,875. Henri Matisse (French, 1869-1954), Teeny. 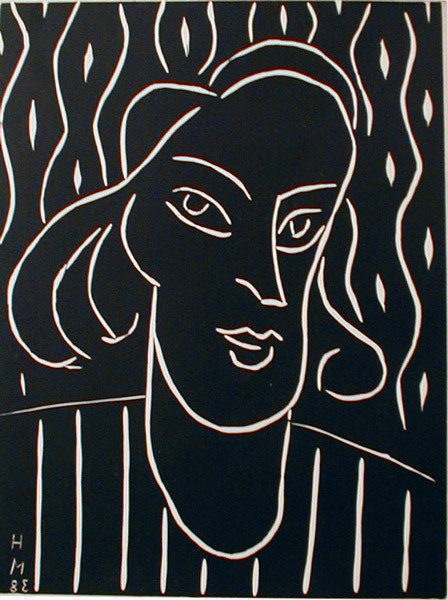 Original linocut, 1938. Edition unknown (c. 1200). Published in the Christmas 1938 issue of the deluxe art review, XXe Siecle. 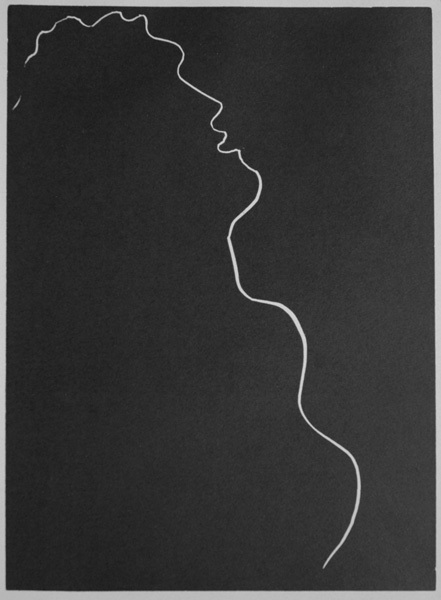 (This is not the reduced-size restrike published in Homage à Matisse in 1970). 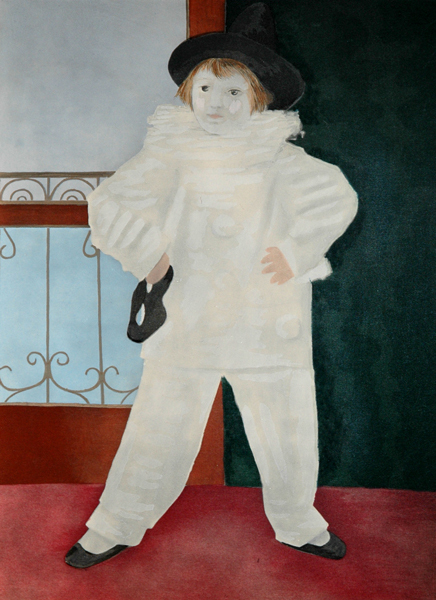 Teeny was the nickname of Matisse's daughter-in-law. In Pablo Picasso Lithographs and Linocuts 1945-1964 Chicago, 1998), R. Stanley Johnson writes that "The first uses of linocuts by significant artists can probably be dated to two works by Matisse and Miró in 1938. These wre followed by two linocuts by Picasso, Head of a Woman and The Squab [Le Pigeoneau], which were used as book illustrations." (p. 16). The Matisse to which he refers is this one (for the Miró Femme, please click on the link). Image size: 302x227mm. Price: $2500. Henri Matisse (French, 1869-1954), L'angoisse qui s'amasse en frappant sous ta gorge (Fribourg 3, Musée Matisse Livres, p. 36; full-page illustration, p. 133). Original linogravure on Arches, 1944. 230 impressions (plus 20 HC) for Henry Montherlant's Pasiphae, Chant de Mino (Le Cretois) published by Martin Fabiani, Editeur plus 20 HC, published by Matisse's heirs in 1981. All of the portfolios were signed by Matisse and all of the blocks were cancelled after printing. Montherlant, a close friend of Matisse's, was a distinguished novelist and critic. This is one of Matisse's most import linocuuts and is illustrated in Henri Matisse: Gravures et lithographies, Musee d'art et d'histoire, Friboug (1982), p. 201. It is also illustrated in Alfred H. Barr, Jr., Matisse: His Art and Public (Museum of Modern Art, 1974). p. 494. Image size: 338x258mm. Price: $3500. Henri Matisse (French, 1869-1954), Portrait of Montherlant (Fribourg 16, Musée Matisse Livres, p. 36). Original linogravure, 1944. 100 numbered impressions for Gravures originales sur la theme de Pasiphae plus 25 HC, first published by Matisse's heirs in 1981. All the blocks were cancelled after printing. With the estate blindstamp. Montherlant, a close friend of Matisse's, was a distinguished novelist and critic; Matisse collaborated with him on Pasiphae. Image size: 245x182mm. Price: $2,875. Henri Matisse (French, 1869-1954), Portrait II de Andre Rouveyre. 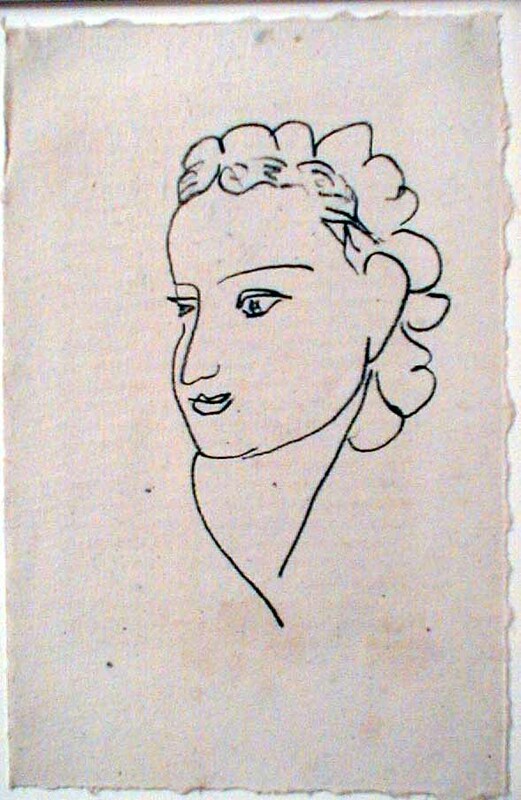 Original lithograph on gray handmade paper for Repli, 1947. Edition: 370 signed and numbered portfolios (of which ours is from n. 136). The stones were cancelled after printing. The justification page was signed by Matisse; purchasers of any of the lithographs published with the book will receive a copy of the justification page. For information on Repli, see: Matisse: L’oeuvre gravé (Paris: Bibliotheque Nationale, 1970), p. 119 lists Repli as #211. Matisse: L’Art du Livre (Nice: Cahiers Henri Matisse 3, Musee Matisse, 1986), lists Repli on pp. 52-53, and illustrates Portrait VI de Andre Rouveyre (which is not on our website). 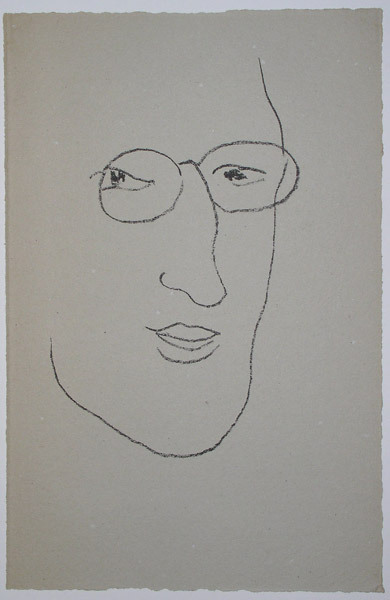 Henri Matisse: Gravures et lithographies (Fribourg: Musée d’art et d’histoire, 1982), lists Repli on p. 202 as book #8 and illustrates Portrait IV de Andre Rouveyre (this is regarded as the most authoritative work on Matisse’s prints after the catalogue raisonné of Matisse’s Oeuvre Gravé. Image size: 250x160mm. Price: $2000. Henri Matisse (French, 1869-1954), Adele VI. Original lithograph on handmade paper for Repli, 1947 Edition: 370 signed and numbered portfolios (of which ours is from n. 136). The stones were cancelled after printing. 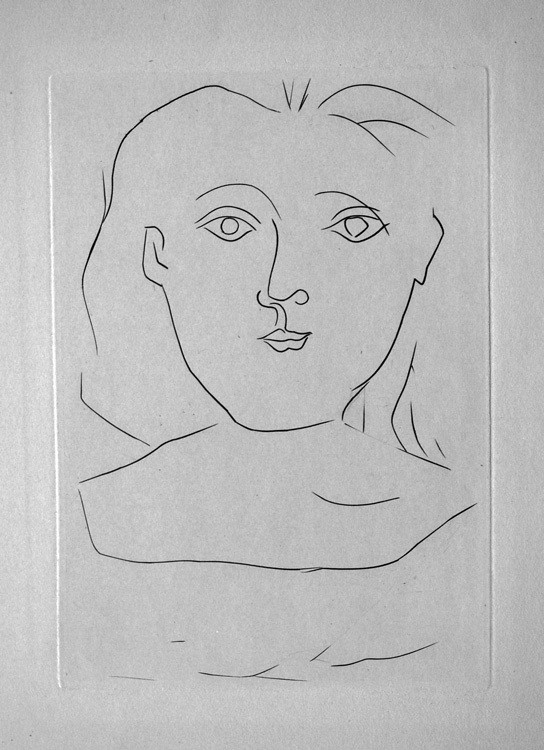 The justification page was signed by Matisse; purchasers of any of the lithographs published with the book will receive a copy of that justification. Image size: 250x160mm. Price: $2250.